LIVE is a suite of virtual programs created by The Marine Mammal Center to connect your class or group with a marine science educator at our hospital and education facility in California. Join us on a Digital Dive into the work of marine mammal health and ocean conservation! What’s the difference between Otariids and Phocids? Take a closer look at the marine mammals that call the ocean home. We’ll seek to understand the differences between marine mammals by studying their unique structures from nose to tail. Discover how veterinarians at The Marine Mammal Center use this knowledge to care for sick and injured marine mammals of the California coast and beyond. How do warm-blooded marine mammals thrive in frigid ocean temperatures? Explore the science behind the processes and behaviors marine mammals use to keep their body at just the right temperature on land and at sea. 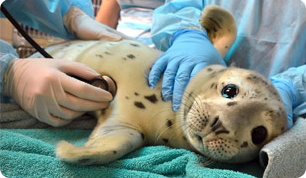 See how The Marine Mammal Center cares for animals that struggle to stay warm. The ocean is a place of inspiration, recreation and commerce for humans. However, human activities and pollution are taking a toll on marine life. We invite students to learn about the challenges facing marine mammals and propose solutions to ecological emergencies at home and abroad. The ocean is getting warmer, sea levels are rising, and critical habitats are disappearing. What does this mean for pinnipeds that rely on coastal habitats to rest and raise their pups? Using the latest climate and oceanographic data, we can make predictions about what the future holds and how we all can make a difference together. Leptospirosis, trauma, biotoxins … Oh, my! Take a deeper look into the injuries and illnesses of one of our most common patients, California sea lions. Students will have the opportunity to practice skills used by our Veterinary Science team to interpret patient documents, analyze data, make a diagnosis and prescribe a treatment plan. Caring for marine mammals requires specialized training and equipment. Through the tireless work of our veterinarians, veterinary technicians and volunteers, we have become a leader in marine mammal veterinary science. Take a deeper look into the spaces and innovative approaches our veterinary science team has developed for the care of animals at The Marine Mammal Center. Note: The Marine Mammal Center is a wildlife rehabilitation hospital; therefore we will not be handling or interacting with live animals during the program. We use still images, video and specimens to represent our work and the animals we care for at our hospital. Scheduling: LIVE programs are offered Wednesday through Friday from 8am to 4pm Pacific Standard Time. Up to 3 classes can participate in the same LIVE program. Cost: In our pilot academic year (2018-2019), LIVE will be offered at no cost to participating schools and organizations. A test call with our educator is recommended at least one week prior to a scheduled LIVE program to ensure a quality experience the day of the program. "This was an invaluable experience for my students. The educator was not only knowledgeable, but he was very personable. He was able to build a relationship with the students that increased their interest in the subject matter." "This program was great, especially as an end-of-testing treat. The educator was great with the kids and included several engagement strategies. I especially appreciated that he tapped into their prior knowledge of oceans." "The educator was a great speaker. Connected very positively with the students and engaged them very effectively. He used great resources, included thoughtful questions for students to "pair-share," and had a good pace in his teaching. We spent an hour (but it went by quickly!). Many thanks." "I thought it was great to have an expert be able to teach the students. The visuals and the resources (otter and sea lion fur) were very helpful for the students to be able to observe." Have questions? We’d love to help! Please email learn@tmmc.org or call (415) 289-7330.